No. 4 Virginia (22-6, 11-5 ACC) plays Clemson (16-12, 9-7 ACC) in Atlantic Coast Conference action in Greenville, S.C., on Tuesday (March 1). Tipoff at Bon Secours Wellness Arena (14,897) is set for 7 p.m. The game will be televised on ESPNU. Virginia aims for its first season sweep and fifth consecutive win against Clemson. 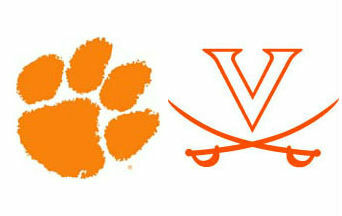 As of Feb. 29, UVA is tied for third in the ACC at 11-5 and Clemson is tied for seventh at 9-7. As of Feb. 29, UVA ranks third nationally in scoring defense (60.2 ppg), seventh in assist-to-turnover ratio (1.57), ninth in field goal shooting (49.2%), 11th in 3-point field goal shooting (40.3%), 17th in free throw shooting (75.7%), 26th in turnover margin (2.8) and 27th in scoring margin (10.8). The Virginia-Clemson game will be televised on ESPNU, streamed online at ESPN3.com and broadcast on the Virginia Sports Radio Network, VirginiaSports.com and Virginia Athletics mobile app on iTunes or Android. Virginia: Tony Bennett (Green Bay, 1992), 158-70 in seven seasons at UVA and 227-103 in 10 seasons overall. Clemson: Brad Brownell (DePauw, 1991), 106-85 in six seasons at Clemson and 273-170 in 14 seasons overall. UVA is ranked No. 4 in the latest AP and USA Today Coaches polls. UVA has been ranked in the top 10 in the AP poll on three different occasions this season (13 weeks overall). UVA has been ranked in the top 10 in 35 of the last 39 AP polls. UVA was ranked in the top 10 in 25 consecutive AP polls from March 3, 2014 to Nov. 16, 2015, its longest span since 49 straight from 1980-83. The Cavaliers’ No. 6 preseason ranking was UVA’s best since a No. 1 ranking to start the 1982-83 season. Virginia is 72-52 all-time vs. Clemson, including a 22-35 road mark, in the series that dates back to 1935-36. UVA posted a 69-62 win over the Tigers on Jan. 19 and has a four-game winning streak in the series. UVA tallied a 63-58 win in its last trip to Clemson on Feb. 15, 2014. The Cavaliers are 4-1 in their last five meetings vs. Clemson and 7-3 in their last 10. Head coach Tony Bennett is 6-3 all-time vs. Clemson. Malcolm Brogdon is Virginia’s current career leading scorer against Clemson, averaging 12.2 points in five career games. Anthony Gill is averaging 10.5 points and 4.5 rebounds in four career games against the Tigers (3 games for UVA and 1 for South Carolina). Malcolm Brogdon tallied 20 points to lead then-No. 13 Virginia to a 69-62 win over Clemson on Jan. 19. Anthony Gill added 12 points and Devon Hall added 11 points in his second straight start for UVA. Virginia shot 54.3 percent from the field (25-46) and out-rebounded Clemson 32-21 in Tony Bennett’s 150th win at UVA. Jaron Blossomgame had a game-high 23 points for the Tigers and Landry Nnoko added 15. Malcolm Brogdon had a game-high 26 points to lead No. 3 Virginia to a 79-74 win over No. 7 North Carolina on Feb. 27. Anthony Gill added 15 points and nine rebounds and London Perrantes chipped in 12 points and six assists. Devon Hall had 11 points, including a pair of 3-pointers, and Isaiah Wilkins added eight points and five rebounds. UVA limited UNC to a pair of fast break points and had 14 second chance points in the win. Joel Berry II led four Tar Heels in double figures with 21 points. ACC Player of the Year candidate Brice Johnson was limited to 12 points, seven rebounds and five turnovers. UNC out-rebounded UVA 36-33 and had 13 turnovers. UVA converted 18-of-21 free throws for 85.7 percent. Virginia hosts Louisville during Senior Day on Saturday, March 5. Tipoff at John Paul Jones Arena is set for 8:30 p.m. The game will be televised live on ESPN.